OTTAWA, April 15, 2019 /CNW/ – This evening, Morguard Corporation (“Morguard” or the “Company”) (TSX: MRC) and Hilton will celebrate the grand opening of the Hilton Garden Inn and Homewood Suites by Hilton Ottawa Downtown. 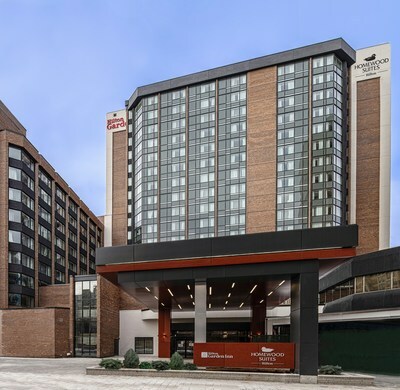 Morguard, who owns the property, began a redevelopment process in 2016 which has culminated in the first dual brand conversion of an existing building in Canada and the first Hilton hotel in downtown Ottawa. Morguard’s owned and managed commercial real estate portfolio in the Ottawa region stands at over five million square feet. In 2018, Morguard acquired the Jean Edmonds Towers, a two-tower office complex in downtown Ottawa, as well as 41 rue Victoria in nearby Gatineau. Other commercial holdings include the Performance Court office tower, the St. Laurent Centre mall, the CBC Ottawa Broadcast Centre and 350 Sparks Street, the office tower next to the hotel which serves as Morguard’s Ottawa office. Morguard Corporation is a major North American real estate company. It has extensive retail, office, industrial, multiâsuite residential, and hotel holdings owned directly, or through its investment in Morguard North American Residential REIT (TSX: MRG.UN), Morguard REIT (TSX: MRT.UN), and Temple Hotels Inc. (TSX:TPH). Morguard also provides real estate management services to institutional and other investors. Morguard’s owned and managed portfolio of assets is valued at $21.0 billion. Please visit morguard.com or follow us on LinkedIn. The award-winning Hilton Garden Inn brand provides business and leisure guests upscale, affordable accommodations and unexpected amenities for an experience that is ‘Simply on Another Level.’ The Hilton Garden Inn Promise affirms the brand’s goal to make each guest’s stay better and brighter. Guaranteed. Team Members at more than 810 hotels in 40 countries around the world ensure today’s busy travelers have a bright and satisfying experience, starting with the first hello. As a recognized F&B leader, Hilton Garden Inn serves locally-sourced food and beverage at its full-service restaurants and bars, featuring cooked-to-order breakfast, handcrafted cocktails, and on-trend small plates. Hilton Honors members who book directly through preferred Hilton channels have access to instant benefits. For more information about Hilton Garden Inn, visit www.hgi.com or newsroom.hilton.com/hgi, and connect on Facebook, Twitter, YouTube, and Instagram. Homewood Suites by Hilton, Hilton’s upscale, all-suite, extended-stay hotel brand with more than 480 locations in the United States, Mexico, and Canada, is an award-winning leader. The first choice for guests seeking comfortable accommodations when traveling for an extended or quick overnight stay, Homewood Suites offers inviting, generous suites featuring separate living and sleeping areas, and fully-equipped kitchens with full-size refrigerators. Additional value-driven essentials include: complimentary internet, a daily full hot breakfast, and complimentary evening socials every Monday – Thursday. Hilton Honors members who book directly through preferred Hilton channels have access to instant benefits, including a flexible payment slider that allows members to choose nearly any combination of Points and money to book a stay, an exclusive member discount that can’t be found anywhere else, free standard WiFi, and digital amenities like digital check-in with room selection and Digital Key (select locations), available exclusively through the industry-leading Hilton Honors mobile app. Homewood Suites is focused on guest satisfaction and stands behind each stay with its 100% Suite Assurance® guarantee. For more information on the extended-stay advantage, visit www.homewoodsuites.com or newsroom.hilton.com/homewoodsuites, and connect with Homewood Suites on Facebook, Twitter, LinkedIn, and Instagram.